« Leadership skills — seasoned or dinosaur-like? 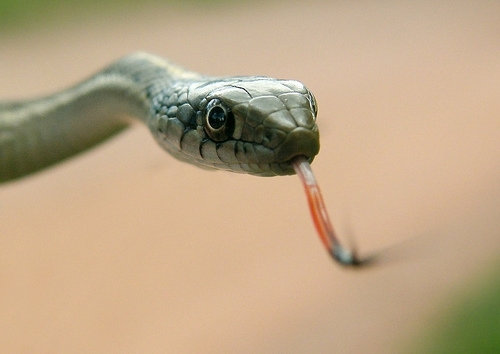 When I saw this photo, I thought, “What a cute snake!” If you fear snakes, you won’t have the same reaction. Although it looks huge, this snake is actually smaller around than the pen or pencil on your desk. It is a harmless, little garter snake. Says a lot about perspective doesn’t it? Perspective is everything, and we tend to hold on to our unique views as if they are solid, immovable truths. Sometimes we see things as huge obstacles until we are past them. Sometimes we walk past a homeless person as if we can’t help. How do you move toward a better, healthier perspective? “We don’t see things as they are, we see things as we are.” So true. I think it’s hard NOT to see things as they are. It’s impossible to be truly objective. But I do agree that it’s important to try and see things through other’s point of view. To be open to opinions other than our own. That does look like a huge snake. This reminds me of the saying: don’t believe what others tell you, go see for yourself. You really do have to stop and look at situations from different vantage points and make up your own mind. I agree about the impossibility of being truly objective. Maybe we should opt for clarity instead? Your words remind me of the parable of the blind men and the elephant — each man felt a different part of the elephant and drew extremely different conclusions about what an elephant is. I liked all three quotes, but I the one that hits home for me is the first one. We certainly can learn from others, and it’s often by observing them. Many people have to “learn the hard way” but I prefer to learn from their mistakes. I move to a healthier perspective by asking myself why? Why am I angry at that person? Why am I feeling anxious? Why am I sad? Because that person said something that reminds me of a past hurt that has nothing to do with today. Because I don’t have all the facts, but can easily gain them. Because my hormones are out of whack, and this will pass. Ah, yes – the hormones! That first quote is awesome. I’ve never seen it before. It’s so true. Every now and again reading Kahlil Gibran’s “The Prophet” is good for the soul. I remember in college learning for the first time that everyone has their own perception of reality. Never dawned on me until then that everyone didn’t see things exactly as I did. I like all three quotes. As I grow older, I’ve learned that listening, really listening (and reading) is one of my keys to gaining new perspectives on life & people. “Really listening” helps me hear, see, and understand. Interesting quote. I’m curious how you apply it! Hi SpaceAgeSage. I’ve been forgetting to check my feed reader and so I’ve missed your last few posts 🙁 . Now I realize that Google Reader and Feeds are 2 different things and this is not a mistake I will make again. I think it is harder to try a new perspective if we feel strongly in our gut about something. When I’m thinking creatively though, I like to try different viewpoints on for size to see how they make me feel. The tech of blogging can be mind-boggling!